Experience the whole new world with the new Vivo 9. Get thrilled with unlimited fun that comes with the all-new Vivo 9. It features the new 19:9 FullView™ Display 2.0, with 90% screen-to-body ratio. 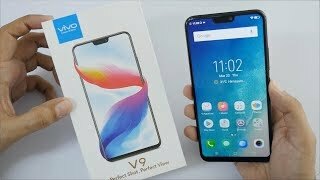 Vivo 9, with just 1.75mm side bezels, offers an incredible 15.51cm (6.3) screen. Experience brightness, color vibrancy, clarity and dynamic selection, even in the dimmest light with V9’s 24MP front camera. Shoot with crystal-clear precision at any time you want and become an artist with each photograph. It includes a 16MP main camera and a 5MP secondary camera and is supported by an AI Bokeh algorithm, which helps to click DSLR-like photos. Use the new AI HDR for clear, natural and richly detailed photos. It’s AI Face Beauty, AR Sticker, AI Selfie lighting feature just makes your photography experience more interesting. Empowered by a Qualcomm Snapdragon 626 octa-core processor, and equipped with 4GB RAM and 64GB ROM, Vivo 9 ensures amazing performance. It also includes the latest Android 8.1, which is designed to offer more battery life and operation speed and improves security. Its all-new AI Face Access technology unlocks the phone instantaneously once V9 scans your facial features. By using its Game Mode, you can block all messages, calls, and alerts. You can also reject or ignore calls by swiping up while playing. By using its new picture-in-picture feature for games, you can open a messaging app without stopping your game.